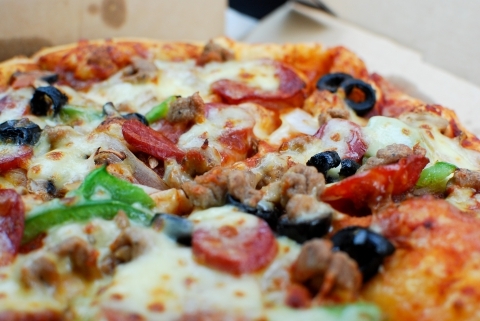 We all know our eyes are bigger than our stomachs, especially when it comes to pizza. So when we order two large pizzas and leave more than half of the second pizza, the leftovers make for a perfect breakfast, lunch, or dinner the next day. A test for just how good the pizza is how good the leftovers are? Since so much of the pizza is eaten the day after, there have been some surprisingly amazing methods for reheating and revamping your pizza. At Upper Crust Pizza, we want you to get the full pizza experience and we want your second pass to be just as good as the first. 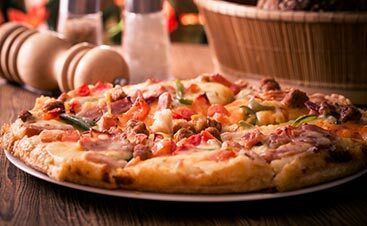 Come in tonight to try our gourmet pizza or order pizza delivery and read up on these tips to ensure you have a second delicious pizza meal tomorrow. Preheat a skillet on medium-high heat. Use either a nonstick pan or a cast iron skillet if you have one. Toss a little bit of oil in the pan and place the pizza cheese side down. Let that side warm up until the cheese is melted and has a nice crust. Flip the pizza over to the crust side for another couple of minutes and you have yourself pizza with a crispy crust and melty cheese just like the night before. With water? Yes. With your skillet of choice, turn the heat to medium-low. Place your pizza in the skillet and let it cook for a minute to two. Pour one or two teaspoons of water into the skillet and cover it with a lid. Leave the pan covered until the cheese is melty and yummy. 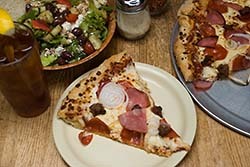 With a lid on the skillet, the water essentially steams the pizza, but it’s not enough to make the crust soggy and sad. If you have a waffle iron, even if it is gathering dust in the back of a cupboard, pull it out, dust it off, and heat it up. Fold your pizza, pulling the tip towards the crust. You can leave the crust for some extra crunch, or if you prefer, it can be cut off. Take the folded pizza and cook it for about four or five minutes in the waffle iron until the crust is crisp and the cheese is melty. If you have some leftover marinara sauce, ranch, or honey, the dimples that were created by the waffle iron are helpful at pulling up some extra sauce. If you would like an easier and faster way to heat up your leftover pizza, the microwave can now be used and it won’t result in soggy and floppy pizza. Use a microwave-safe glass filled with water and place it in the microwave with the pizza. Cook it for 45 seconds to a minute. Make this the night of or wait until morning, either way, you can enjoy a delicious and protein-full breakfast. Tear up a piece of pizza into pieces and mix two eggs with some extra cheese. Add a tablespoon of milk and a dash of salt and cook the pizza/egg combination in a skillet. You can garnish the dish with some fresh herbs such as basil or cilantro or splash some hot sauce for a spicy breakfast. Two great Italian dishes in one, what could be better? Remove the crust from the leftover pizza slices. In a baking dish, pour a layer of tomato sauce and place two slices of pizza, cheese side up, on top of the sauce. Add some ricotta cheese, some extra mozzarella, and some more tomato sauce. Add another two slices of pizza, but with the cheese side facing down. Repeat these steps until you use all of your leftover pizza and be sure to top it all off with more cheese. In a 350 degree oven, cover the dish and cook for 30 minutes. Then, uncover the dish and cook an additional 10 minutes to brown the cheese. To use the crusts of the pizza, coat them with some butter and garlic powder and reheat them in the microwave for soft and buttery breadsticks! Stand aside, grilled cheese, leftover pizza is here. Cut the leftover slices into squares. Create mini pizza sandwiches with two of the squares, cheese sides facing each other. Heat up a panini press and place your mini sandwiches on the grill. Cook for about five minutes or until the crust is crispy and the cheese has melted the pieces together. If you don’t have a panini press, use a skillet and press the pieces down with a spatula. Top hot tomato soup with these sandwiches, grab a blanket, put on a movie and you’re set for the night. Because grilled cheese is better with pizza. With a skillet or panini press heated up to medium-high, place one piece in the skillet, crust down. Sprinkle some extra cheese on the piece in the skillet and place the other piece on top, cheese side down. Cook for about five minutes in a panini press, or three minutes on each side in a skillet. 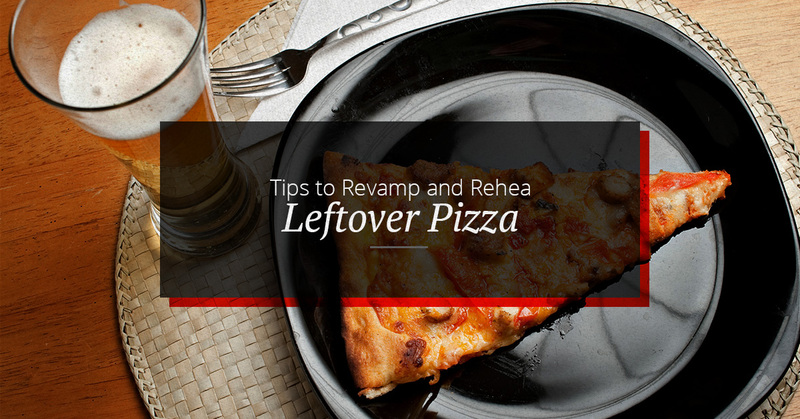 As hard as we try to eat it all in one sitting, leftover pizza is hard to avoid sometimes. To get the most from every slice, be as creative and adventurous with your leftover pizza as you can! 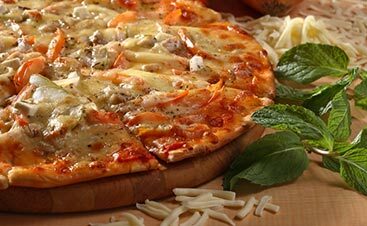 Upper Crust Pizza encourages all methods of reheating and enjoying delicious craft pizza. 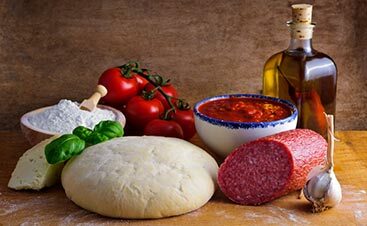 Whether you’re dining in or ordering pizza delivery, our gourmet pizza will be satisfying and delicious whenever and however you eat it.